Potholes can be more than a nuisance. They can be a danger to cyclists and others. In the UK, there’s an average of one road defect for every 110 metres of road. Local councils have a duty to maintain the roads, but they can only fill a pothole if they know about it. If you want it repaired, you have to report it. 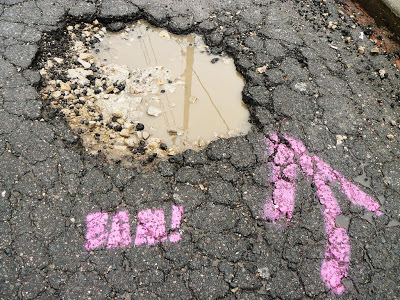 FillThatHole is the easy way to report potholes and road defects. They contact the right people to get the roads repaired. Most councils are generally quick to respond. At the time of writing, Darlington Borough Council have received 130 notifications of road hazards. Of these 87 have been fixed, 41 rejected and 2 are pending. This represents a success rate of 68%.